The work is based on a cartoon, now lost, drawn by Michelangelo in 1531 and representing “A Christ appearing to the Magdalene in the garden.” Only two preparatory studies for the figure of Christ in this composition are known, both of them now in Casa Buonarroti (inv. 62 F and Archivio Buonarroti, I, 74, 203 verso). Pontormo immediately made a painting from the cartoon, at the suggestion of Michelangelo himself, who was able to follow the work closely as it was done in his own house. The cartoon and painting had been commissioned, through the mediation of the archbishop of Capua, Nicholas von Schomberg, by Alfonso d’Avalos, marquis of the Vasto and a general in Charles V’s army, on behalf of his aunt Vittoria Colonna, marquise of Pescara and widow of Francesco Ferrante d’Avalos, who was killed at the battle of Pavia in 1525. This first contact between Michelangelo and Vittoria through, an intermediary was to be followed by their meeting face to face, three years later, in Rome. 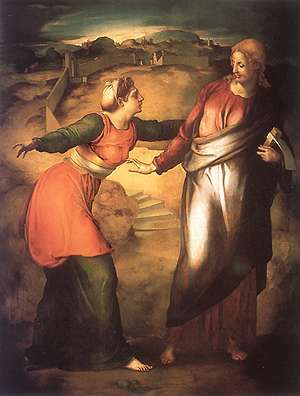 The choice of the subject represented in the work should undoubtedly be ascribed to Vittoria Colonna: in fact the poetess had a fondness for Mary Magdalene that may well have derived from her personal experience, as if she identified to some extent her own abandonment of worldly life following her widowhood with the redemption of the woman in the Gospels. It should be pointed out that in the same year of 1531, Vittoria had commissioned another painting on this theme: on March 5 she had asked Titian, with Federico Gonzaga acting as a go-between, to paint for her a Magdalene “as pitiful as possible.” The painter had already finished the picture just over a month later and it has often been identified with the celebrated panel in Palazzo Pitti. In addition, Vittoria was actively engaged in supporting the Casa delle Convertite in Rome, an institution that took in prostitutes who wanted to redeem themselves without taking the veil as nuns. There are frequent allusions to the Magdalene in her writings. The picture painted for Vittoria Colonna is now in a private collection at Busto Arsizio, and matches the descriptions in the sources by its high quality, its “coloring” typical of Pontormo and, above all, its measurements (124 × 95 cm), which correspond to the small dimensions requested by the client. In his Life of Pontormo, Vasari states that the artist made a replica of the painting for Alessandro Vitelli, ruler of Città di Castello and stationed in Florence at the time as leader of the imperial troops. It has been proposed that this version, of larger size than the picture for Vittoria Colonna but with an almost identical ratio of height to length, is in fact the one in Casa Buonarroti, whose presence in Florence was mentioned for the first time in 1666, when it was transferred from the collection of Cardinal Carlo dei Medici to the grand-ducal collections. The question of the actual author of this work remains open: some critics have wondered whether it was really painted by Pontormo, as is stated in the inventory of 1666 and claimed by Luciano Berti, who in 1973 ascribed “the invention of the extremely beautiful as well as melancholy landscape” to Jacopo, or should instead be seen as the work of his pupil Bronzino, as Roberto Longhi argued and is believed by, among others, Michael Hirst, the author of the most important essay on this subject.